mlb authentic jerseys Darrell Katz - Why Do You Ride? Arriving on the cusp of the Jazz Composers Alliance Orchestra’s thirtieth anniversary year, Why Do You Ride? 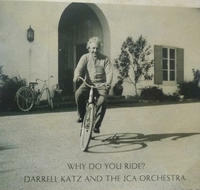 (October 14, Leo Records)shows off Katz’s deft ability to juggle off-kilter modernism with electrifying dynamic shifts and a tumult of jazz-history reference points in his vivid, smash-cut big band arrangements, all combined for this excursion with his love for cycling and a fascination with what Albert Einstein had to say about learning, knowledge, love and war. The results are executed by an expert ensemble that tempers virtuosity with a liberal dose of irreverence, precisely navigating hairpin turns while maintaining just enough danger to make you believe you just might go off the cliff into total chaos. “When the legend becomes fact,” goes the oft-quoted line from The Man Who Shot Liberty Valance, “print the legend.” Thinking along similar lines, composer and bandleader Darrell Katz has set to music some of the most memorable quotations that Albert Einstein never said (and one or two that he actually did) on Why Do You Ride?, the latest CD by the Jazz Composers Alliance Orchestra. After all, if a saying is profound enough to inspire the kind of dense, genre-spanning, continually surprising sounds that fill this disc, then what does it matter if it was ever actually spoken by the particular genius to whom it’s been attributed? Arriving on the cusp of the JCAO’s thirtieth anniversary year, Why Do You Ride? (October 14, Leo Records) shows off Katz’s deft ability to juggle off-kilter modernism with electrifying dynamic shifts and a tumult of jazz-history reference points in his vivid, smash-cut big band arrangements, all combined for this excursion with his love for cycling and his less-than-thorough internet research standards. The results are executed by an expert ensemble that tempers virtuosity with a liberal dose of irreverence, precisely navigating hairpin turns while maintaining just enough danger to make you believe you just might go off the cliff into total chaos.